When you provide the day-to-day care for your horses it is difficult to trust another person to provide the same level of care. Will they recognize a serious medical condition? Will they feed on a regular schedule? Will they be there if your horse injures itself and will they know what to do? Sometimes you decide to forgo your vacation or a trip to visit family because you cannot find professional care for your horse. At Autumn Ridge Farm, LLC we provide professional short term care by experienced adults. Your horse will receive the same level of custom care as we give all the horses at Autumn Ridge. Please click on Boarding for a description of these services. Your horse will be kept in a separate paddock with a private run-in shed. 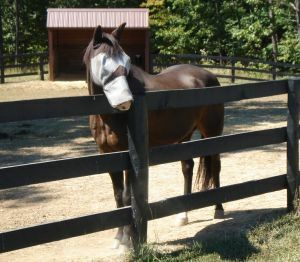 This unique facility allows us to board horses for brief periods of time without exposing them to introductions to a new herd. We can accommodate up to two horses as long as they have already been stabled together. The daily rate for one horse is $15.00 per day; for two horses is $25.00 per day. Weekly rates are available. We provide the hay and a constant supply of salt and water. You provide the feed.